A city and district on the northern frontier of Palestine (Num. xiii. 22, xxxiv. 8; I Kings viii. 65; and elsewhere), situated at the foot of Mount Hermon (Josh. xiii. 5; Judges iii. 3). It is once called = "the great Hamath" (Amos vi. 2). 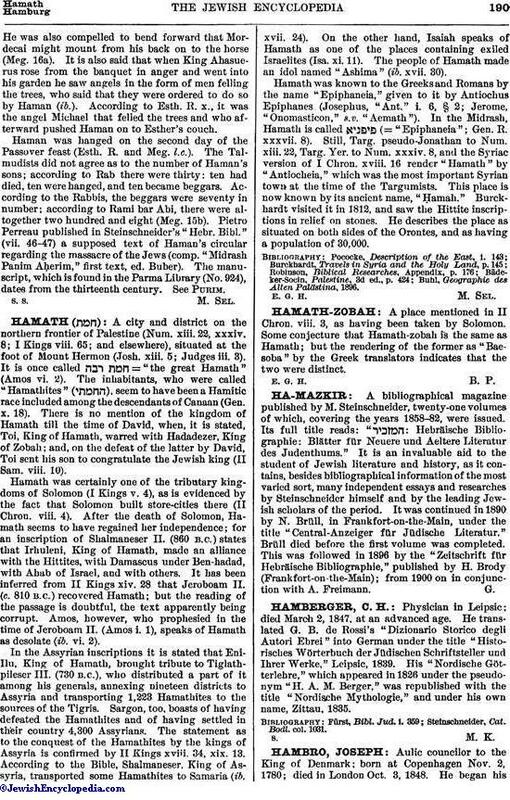 The inhabitants, who were called "Hamathites" ( ), seem to have been a Hamitic race included among the descendants of Canaan (Gen. x. 18). There is no mention of the kingdom of Hamath till the time of David, when, it is stated, Toi, King of Hamath, warred with Hadadezer, King of Zobah; and, on the defeat of the latter by David, Toi sent his son to congratulate the Jewish king (II Sam. viii. 10). Hamath was certainly one of the tributary kingdoms of Solomon (I Kings v. 4), as is evidenced by the fact that Solomon built store-cities there (II Chron. viii. 4). After the death of Solomon, Hamath seems to have regained her independence; for an inscription of Shalmaneser II. (860 B.C.) states that Irhuleni, King of Hamath, made an alliance with the Hittites, with Damascus under Ben-hadad, with Ahab of Israel, and with others. It has been inferred from II Kings xiv. 28 that Jeroboam II. (c. 810 B.C.) recovered Hamath; but the reading of the passage is doubtful, the text apparently being corrupt. Amos, however, who prophesied in the time of Jeroboam II. (Amos i. 1), speaks of Hamath as desolate (ib. vi. 2). In the Assyrian inscriptions it is stated that EniIlu, King of Hamath, brought tribute to Tiglathpileser III. (730 B.C. ), who distributed a part of it among his generals, annexing nineteen districts to Assyria and transporting 1,223 Hamathites to the sources of the Tigris. Sargon, too, boasts of having defeated the Hamathites and of having settled in their country 4,300 Assyrians. The statement as to the conquest of the Hamathites by the kings of Assyria is confirmed by II Kings xviii. 34, xix. 13. According to the Bible, Shalmaneser, King of Assyria, transported some Hamathites to Samaria (ib. xvii. 24). On the other hand, Isaiah speaks of Hamath as one of the places containing exiled Israelites (Isa. xi. 11). The people of Hamath made an idol named "Ashima" (ib. xvii. 30). Hamath was known to the Greeks and Romans by the name "Epiphaneia," given to it by Antiochus Epiphanes (Josephus, "Ant." i. 6, § 2; Jerome, "Onomasticon," s.v. "Aemath"). In the Midrash, Hamath is called (="Epiphaneia. "; Gen. R. xxxvii. 8). Still, Targ. pseudo-Jonathan to Num. xiii. 22, Targ. Yer. to Num. xxxiv. 8, and the Syriac version of I Chron. xviii. 16 render "Hamath" by "Antiocheia," which was the most important Syrian town at the time of the Targumists. This place is now known by its ancient name, "Ḥamah." Burckhardt visited it in 1812, and saw the Hittite inscriptions in relief on stones. He describes the place as situated on both sides of the Orontes, and as having a population of 30,000. Buhl, Geographie des Alten Palästina, 1896.